This is the seventh in a set of journals celebrating the days of the week. In many languages the name means the Sun’s day, in others the Lord’s day, the day of rest. 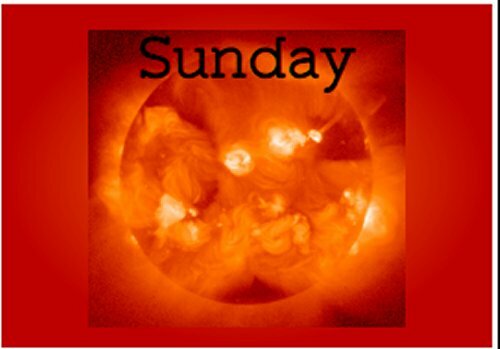 In the Thai Solar Calendar Sunday is regarded as a red day. Since the Thai Solar Calendar attributes a colour to each day of the week I decided to use these colours in the journals to represent the days. What does Sunday mean to you? Does Sunday have a particular significance, a poem it brings to mind, or something visual it brings to mind? Use the pages as you wish, but leave the work of others unaltered please.